Unless it’s a special piece like a cocktail dress (or this skirt! ), I don’t wear a whole lot of prints on the reg… but one print I do buy again and again is the stripe. 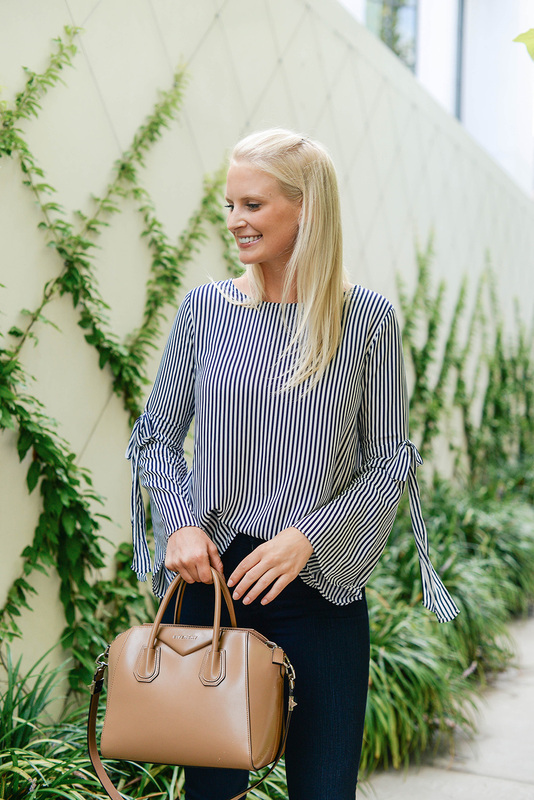 This navy + white stripe blouse is such a pretty staple that clearly can go casual or dressy with just a change of accessories and bottoms. Tuck it into a white or navy skirt for work or pair with flattering skinny jeans for dinner! While the tie sleeve detail adds some interest and keeps the look on-the-pulse with the statement sleeve trend, it’s subtle enough for even the most important meetings and work events. The long sleeve style will easily take you into fall, and the fabric is lightweight and thin giving the armholes in your trench coats and jackets breathing room. Take a cue from this season’s pajama trend with this tipped blouse. It’s still sophisticated as hell, but with just a touch of that bedtime look. PS – it’s under $80! If you’re on the hunt for a timeless, everyday basic, look no further than this blouse. You’ll wear it for years and it is such a great blank canvas! This pretty plaid top is on sale for under $100, and the gorgeous bow-neck detail adds a glamorous touch. If you wear a bunch of black, this white blouse with embroidered bell sleeves will add a punch to your work wardrobe staples. Also under $60! This green Tibi blouse is the ideal transitional hue for fall, and the sleeves are so much fun! Did I mention it’s on sale? Love ruffles like I do? Check out this Club Monaco blouse. The delicate sleeves will give you all the heart eyes. This bishop-sleeve top comes in three great neutral hues and is on sale for under $50! Here’s another beautiful green button-down to wear this season. The subtle sheen in the fabric makes it super easy to dress up! It’s also on sale! Can’t never go wrong with stripes, love that little bag. You got me with those stripes and earrings. I love a good striped top and this top is gorgeous!